Since the night of that dream she felt the new life within her. Almost three years later, when she attended her son's enthronement (the present Eighth Kyabje Dorzong Rinpoche), at Dorzong Monastery, she saw the Drukpa Kagyu meditation hat for the first time in her life and recognized it from her dream. And when she described the high-crowned white hat worn by the central young lama, the senior lamas at Dorzong Monastery told her that this was Rechunpas hat. The origin of the Dorzong emanations is Vajrapani, Ananda, Palgyi Dorje, one of the 25 chief disciples of Padmasambhava and Rechungpa, one of the two main lineage holders of Milarepas teachings. Kyabje Dorzong Rinpoche was born in early summer, at sunrise. A fine drizzle fell from a thin cloud and rainbows appeared over the family home. The people of Ngeyul village felt certain that the child was a tulku when seeing these special signs. That same morning a lotus design appeared on the waters surface in four of the seven offering bowls in the family shrine room. The pattern descended and became indelibly embedded in the base of the bell-metal bowls. These treasured family possessions were destroyed at the time of the Cultural Revolution in Tibet. Also on the same morning a pair of ravens suddenly appeared and perched on the familys roof. 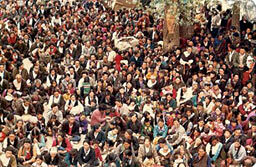 There they stayed until the day the infant Kyabje Dorzong Rinpoche was taken to his monastery. It was later discovered that these were the same ravens, that normally lived on the roof of the protectors gonkhang at Dorzong Monastery, in Gon Jo, but had disappeared at the time of Dorzong Rinpoche's birth. This monastery was founded during the reign of the Fourth Kyabje Dorzong Rinpoche, when the people of Gon Jo had asked that another monastery be established in their area. This new monastery was a two-day horse ride from Ngeyul. The Eighth Kyabje Dorzong Rinpoche was enthroned at the age of three. From five years old he began to study. In reading, writing and memorizing he showed exceptional aptitude. When he was seven, he visited Khampagar Monastery to meet the Eighth Kyabje Khamtrul Rinpoche. 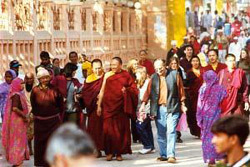 At his time the Great Practice of Padmasambhava Sadhana was being performed at the Khampagar Monastery. This sadhana is held every 12 years and takes almost one month to complete. The young Kyabje Dorzong Rinpoche joined in the practice and completed the ritual entirely from memory. A large assembly witnessed this feat and the feeling was that this young Rinpoche was exceptional. When he was nine, he received special Mahamudra and Dzogchen meditation practice and was guided through these experiences by the Kyabje Ragtul Rinpoche (one of the most respected non-sectarian masters of that period) and was also given the full set of Kagyu tantric treasures teachings (Kagyu Ngag Dzod), as well as all the Namchoe terma transmissions. Additionally, he received three main Nyingma practices of the tutelary deities of Padmasambhava, which were discovered in the eleventh century and also the full teaching of Tsele Natsog Rangdol. At this time he received all the ancient 100.000 tantric teachings of the Nyingma Lineage transmission (Nyingma rgyud bum) from Venerable Rongmi Lama Gedun. At the age of fourteen he entered Khampagar Monasterys Institute for Higher Studies and studied under the great Khenpo Pema Tharchin from Kathog, the ancient Nyingma Monastery. 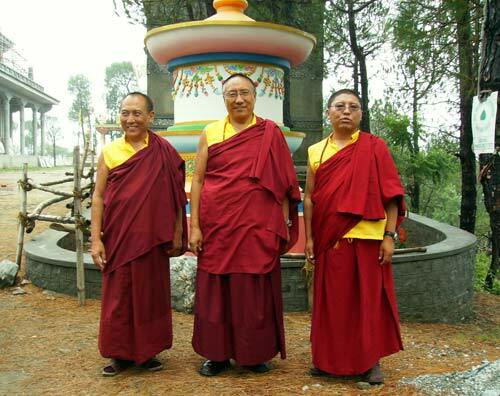 Under this eminent Khenpo he learned the Madhyamika and the two main Abhidharma Kosha texts, as well as Buddhist philosophical texts by Kyabje Mipham Rinpoche. In his examination, he always stood first in his class. 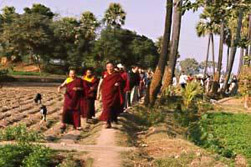 Once Kyabje Dorzong Rinpoche was invited by the people of Rongmi to visit their area near the original Dorzong Monastery. In this region there lies a range of jagged mountains the Yongten Ritra (Bright Mountain of Good Attributes), and many lakes of which it is said that treasure teachings of Padmasambhava are still hidden there. The party halted in a meadow where the local nomads brought them yogurt and milk. The sky was clear and blue. Then, as they sat doing prayers, two banks of clouds appeared in the sky above them. Then, one after another, wisps of ribbon-straight clouds emerged from one cloudbank and floated parallel to join the other, in all nine perfectly formed strips. The people gathered there were amazed. After a long period of awed silence, the nine straight wisps returned in succession to be reabsorbed in the cloudbank. Then the two cloudbanks merged and there was a roll of thunder and a shower of rain fell. The nomadic elders agreed that they had never seen such a phenomenon before. On hearing the story, one of Kyabje Dorzong Rinpoches first root gurus, Kyabje Ragtul Rinpoche explained that since the local gods, protecting Padmasambhavas teachings have connections with the previous Kyabje Dorzong Rinpoche these clouds had been a scarf offering from these nine gods of the area to welcome the young tulku on his first visit there. In that position he performed all the consultations and arrangements for the recognition of the reincarnation of the present Ninth Kyabje Khamtrul Rinpoche in conjunction with His Holiness the Sixteenth Karmapa and Kyabje Dilgo Khyentse Rinpoche. The enthronement was performed in 1983. Both as Regent of The Eighth Kyabje Khamtrul Rinpoche and President of Khampagar Monastery in India and of Tashi Jong Tibetan Community, Kyabje Dorzong Rinpoche worked twenty-one years with selfless compassion, wisdom and great energy for the betterment of the monastery and lay people community. Along with the consolidation of the craft art center and cultured activities, he introduced a proper health center, kindergarten and an Institute for Higher Studies. Later in the 1990's, he received a complete series of initiations of the Drukpa Lineage from the late Kyabje Trulshik Adeu Rinpoche.